Iron is a mineral commonly found in red blood cells, where it helps transport oxygen around the body. An iron deficiency can cause anemia and fatigue that can be treated and prevented with supplements. Iron supplements are probably safe for most people when taken at the recommended dose, though they can cause side effects. High doses can lead to serious complications and even death. Talk to your doctor before taking iron supplements. If you are a man or a post-menopausal woman, your iron needs are minimal and are probably reached through diet. Iron supplements can cause indigestion, stomach pain, constipation, diarrhea, nausea, vomiting, back pain, muscle pain, chest pain, chills, lightheadedness and fainting, rapid heartbeat, fever, sweating, flushing, headache, metal taste, numbness or tingling in the hands and feet, rash and breathing problems. You may be able to reduce some of these side effects by taking your supplement with food, according to Medline Plus. But you should first try to take your iron supplement on an empty stomach if you can because food can reduce how much iron your body absorbs. Liquid iron supplements can cause tooth discoloration. You may be able to prevent this staining if you dilute the supplement in water or juice or drink it through a straw. To prevent the risk of iron poisoning, do not take more than 45 milligrams a day of iron if you are over 14, unless your doctor has prescribed it, because that is the highest safe dose. Children and babies under age 13 should not take more than 40 milligrams a day. High doses of iron can cause stomach and intestinal problems, liver failure, dangerously low blood pressure and death. Iron poisoning is the most common cause of poisoning deaths in children, according to Medline Plus. Symptoms of iron poisoning include bloody diarrhea, fever, nausea, sharp stomach pain and severe vomiting -- possibly of blood -- a blue tint to the lips, nails and palms, seizures, pale or clammy skin, shallow or rapid breathing, extreme fatigue and a weakened or fast heartbeat. If you suspect iron poisoning, seek emergency medical care. If you are a man or post-menopausal woman your recommended daily intake is only 8 milligrams, which is often attainable through meats and fortified foods. Deficiency is rare and you should not take an iron supplement unless prescribed by your doctor. If you have heart disease or are at risk for it, or if you have diabetes, talk to your doctor about whether you should take iron supplements. Some researchers fear iron supplements may increase the risk of heart disease, but the evidence so far is contradictory, reports Medline Plus. If you are pregnant or breast-feeding, recommended doses of iron are probably safe but high doses may be dangerous. If you have an ulcer or an inflammatory intestinal disease such as ulcerative colitis or Crohn’s disease, iron supplements may aggravate your condition. If you have a hemoglobin disease, such as thalassemia, or an iron overload disease, or anemia that is not caused by iron deficiency, iron supplements may cause iron poisoning. Do not give iron supplements to a premature infant without talking to your doctor first because it can cause complications. 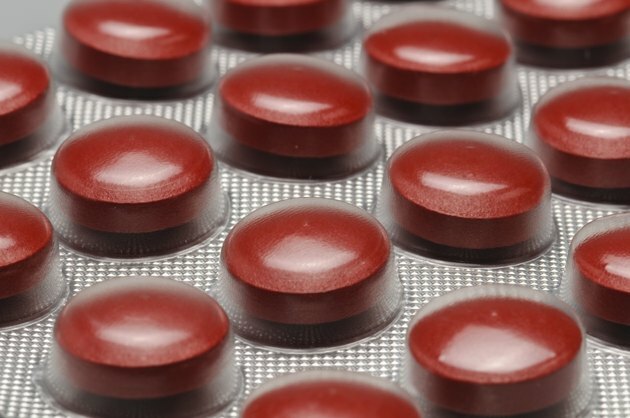 When iron supplements are taken in combination with certain common prescription drugs, they may increase your risk of side effects or change the effectiveness of your medication, according to Medline Plus. Talk to your doctor or pharmacist before combining iron with antibiotics, bisphosphonates, levodopa, levothyroxine, methyldopa, amygdalin, digoxin, eltrombopag, mycophenolate mofetil and penicillamine.